I strongly believe that kids need to get dirty and experience messy play, a few germs never harmed us as kids growing up and it does worry me that we are fast becoming a nation of sterile homes and children which I think causes more serious health issues when they are exposed to germs and viruses. Saying that though there has to be a balance of allowing normal contact with daily germs and dirt with keeping the levels to a safe minimum. Working in a childcare setting it is clear how fast germs can spread if not correctly managed. Responsibility for this has to sit with both ourselves as a setting and parents. It is vitally important we follow correct infection control procedures but we rely on parents being honest about illnesses and understanding when they need to keep the children away to keep cross contamination to a minimum. Having a good cleaning schedule is as important as having a good child protection procedure in place. Without it serious risk of harm could come to the children. 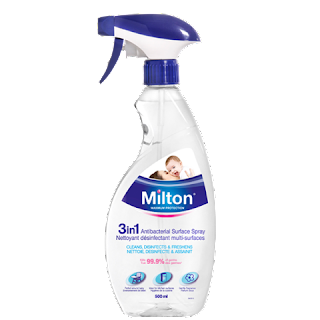 A brand I have been trying out lately is Milton, I think we are all familiar with the brand from having babies and using Milton as a sterilising fluid for sterilising bottles to cleaning surfaces. But did you know the Milton range also includes hygiene products like antibacterial wipes, antibacterial hand gel and antibacterial surface spray. Having the Milton brand name gives confidence in the products effectiveness as it's a name we put our trust in at the most important time of our lives, when we bring a tiny new baby home. The antibacterial wipes are great to grab and go for spills and clean ups and handy to keep in your changing bag for a wipe down of facilities when out and about and are even safe on dummies and teethers, they are fragrance free and 100% biodegradable. The antibacterial spray killls 99.9% of germs so you can have confidence in its three in one action of cleaning, disinfecting and freshening. it has a lovely clean and fresh fragrance, ideal for all surfaces and furniture. My favourite especially in work is the antibacterial hand gel, we are continually wiping snotty noses, picking up toys that have been chewed and assisting with nappy changes and toileting so it is important we practice good infection control with effective hand washing and use of hand gels. The gel has a gentle fragrance and has added moisturising agent to help protect the skin. 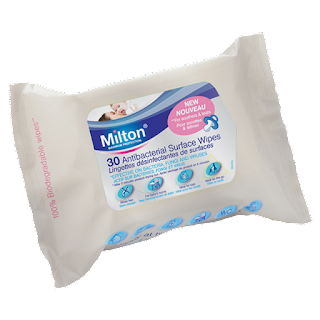 All Milton product are available from most supermarkets as well as Wilko, superdrug and boots. So for a brand you can trust and rely on I would recommend Milton fro all your sterilising and hygiene products.